RDD Round Wire Lockit - Bolt Products Inc. Automated application equipment speeds assembly and lowers costs while reducing or eliminating repetitive manual assembly motions. Can be preassembled onto wire since chassis insertion isn’t required to keep it LOCKED on the wire. Multiple panel locking steps snug lockit strain relief into range of panel thicknesses up to .187". Recognized (far exceeds UL's 35# pull-out test). Black, white, and custom colors available. For Heyco automated assembly equipment. 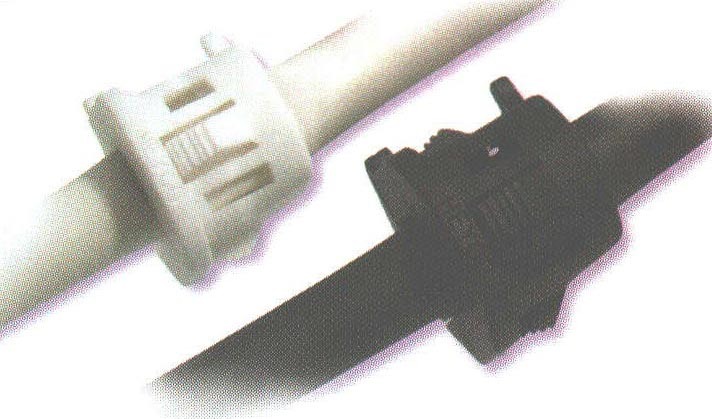 For matching plugs which can be used to fill/blank unused mounting holes.